The Hobbit is Lord of the Rings-0, the official prequel to the series by J.R.R. 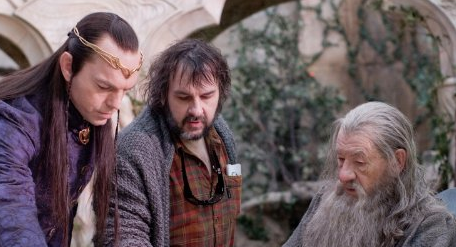 Tolkien and the movies by Peter Jackson, this time with an intrepid host of adventuring dwarves looking to reclaim their home. 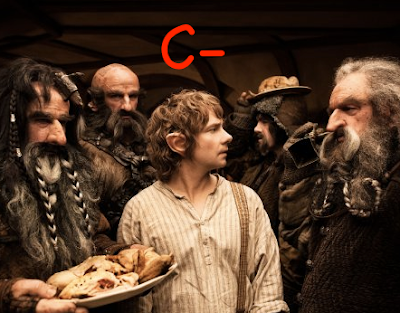 When forced from the kingdom of Erebor by a fierce dragon named Smaug, years of darkness and an unlikely adventure culminate with the young hobbit Bilbo Baggins and Gandalf the wizard. This radiantly well animated work shares the strengths of LOTR in nearly every way in its intricate makings, but has its own – and some of the same – weaknesses, including terrible pacing and a plot that is too choked at the roots by its creator’s overkill attention to detail. Jackson has, in a very real sense, become another Michael Bay. As a big non-fan of the series (and every one of the LOTR movies), I do not have a basis on which to critically break down themes such as credibility to its source material or faithfulness to the story at large, but I can vouch for the fact that this thunderous overachievement is the movie’s greatest downfall. The amount of details actually assault the senses. Fanciful creations of orcs, goblins, and trolls (and their movements and dances and quirks and even cultures) consume so much screen time that it is a wonder they got to bring in the haunting dialog that explains for us the progressively perilous journey as it unfolds, or parts from some of the more impression-making characters who add a dimension of credibility like Hugo Weaving as “Elrond.” In a nearly 3-hour-long movie, our patience is thoroughly tested, and it may only be the long-time fans of the series that can really pass that test by identifying positively with much here. The unsatisfying combat, thrown around with spell-casting and a sword-wielding wizard, make this a goofy adventure like what we saw in LOTR. Perhaps mainly 7th-graders who have read the novel should endeavor to grade such a movie as it plays out like a Nickelodeon one-hour special (but we wish it was just one hour). Simply too much is happening with everyone and everything, making this a headache-inducing story—and one that is broken in half as we have to wait a while before the second movie comes out for the conclusion. Frankly, I found the film to be an exercise in excess and a drawn-out ordeal to watch. I was quite glad when it was over. Unexpected journey? More like unexpected boredom.